Genieße das vollmundige Bouquet aus Frucht- und Malzaromen mit einer milden Bittere. Goldgelb, obergärig, hefetrüb, spritzig-fruchtig mit feiner Schaumkrone. Enjoy the full-bodied bouquet of fruity and malty aromas and a mild bitterness. Golden, top fermented, unfiltered, tangy-fruity with a fine head. UPDATED: DEC 5, 2018 Draught, taster. Sampled on the 24/11/2018 at 'Union Brauerei', Bremen (Germany). Slightly cloudy yellow colour with a medium off-white head. Aroma is banana, sweet malts, coriander and some wheat. Taste is yeasty with presence of banana and some coriander. Finish is medium sweet and slightly fruity. Next one please! UPDATED: APR 6, 2018 A strong smell of banana and yeast, light sweet aroma of vanilla. The small white fizzy head has a short duration, the body is cloudy and orange. A yeasty taste, light fruity and sour. The body is light, dry with a lively carbonation. 750ml bottle. Slightly cloudy, yellow-ish golden colour with small to average, frothy, half-way lasting, white head. Wheaty, fruity and spicy yeasty aroma, sweet-ish notes of banana, some clove, a touch of orange. Taste is sweet-ish wheaty, notes of banana, a touch of orange, orange zest; slightly monotonous. Bottle. Pours a hazy yellow color with a small white head. Has a fruity wheat malty spicy banana aroma. Fruity wheat malty spicy banana flavor. Has a fruity wheat malty spicy banana finish. 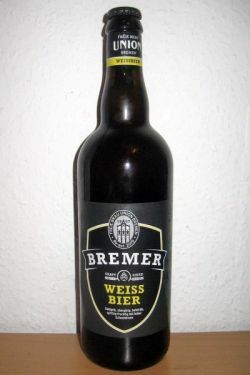 [ As Union Bremer Weißbier ]. Bottled. Yellow coloured. Unclear. No head. Aroma. Spice, fruits, vague flowers. Flavour. Sweetness, citrus, spice. Thin bodied. Ends sweet and fruity. 29-DEC-2016, bottle @yespr tasting. Hazy yellow with a white head. Aroma is yeast, spice, lemon, fruit, wheat. Medium body, sweet, lively carbonation.